SOURCE: 03-19-19 - - "European Banks' Inescapable "Doom-Loop""
The initial negative reaction of their stocks to a new round of loans from the European Central Bank - which are expected to have less favorable terms than in the past - attests to how much support they still need. Lenders on the Stoxx 600 trade at 0.74 estimated price-to-book, about an 11% discount to the 10-year average. That compares with a multiple of almost 1.2 for S&P 500 banks. Earnings growth is expected to stall this year. EPS for Stoxx 600 banks in 2019 is projected to be little changed, according to data compiled by Bloomberg, after rising almost 5% last year. The region’s lenders have been blighted by record-low interest rates and sovereign debt crises. European banks are poised to under-perform in 2019, thanks to structural cracks that cheap valuations can’t paper over. Italian lenders are cheaper still, thanks to bad loans and an overhang of political concern in the wake of last year’s budget saga. They hold the EU’s biggest pile of soured debt - one of the reasons they have a 12-month forward price-to-book of less than 0.6. European banks can offer juicy, stable dividends. The ratio between their 12-month forward dividend yield (5.8%) and that of the Stoxx 600 as a whole (3.9%) is near the highest since 2016. The euro-zone economy is slowing again. The ECB’s downgrade of the growth outlook this month was one of the biggest in years, while the Bundesbank gave up on a first-quarter rebound in Germany as the nation’s industry stumbled. It’s all set the stage for low rates into the foreseeable future. That’s the doom loop -- slowing growth and low yields, a toxic combination for banks. Until that changes, there’s little prospect for their earnings, valuations or share prices to improve. 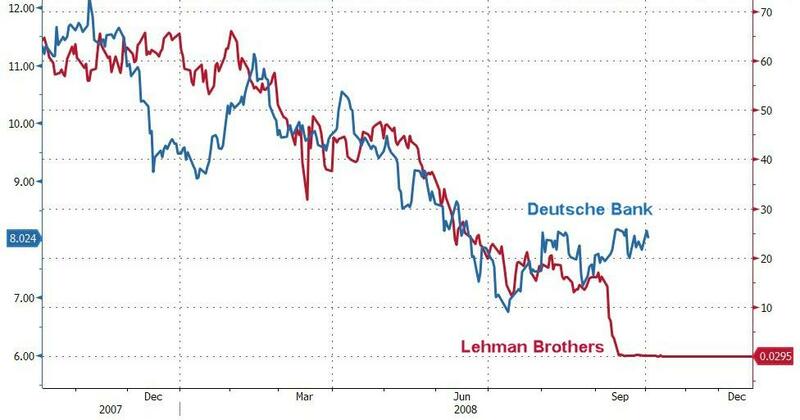 With Deutsche Brothers Bank on its back and Draghi flip-flopping back to his uber-dovish, yield-curve-collapsing alter-ego, Bloomberg's Heather Burke details how European banks are caught in an under-performance 'doom-loop'. European banks are poised to underperform in 2019, thanks to structural cracks that cheap valuations can’t paper over. The region’s lenders have been blighted by record-low interest rates and sovereign debt crises. The initial negative reaction of their stocks to a new round of loans from the European Central Bank - which are expected to have less favorable terms than in the past - attests to how much support they still need. Sure, at first glance bank valuations look cheap - but given the macro backdrop, perhaps not cheap enough. True, European banks can offer juicy, stable dividends. The ratio between their 12-month forward dividend yield (5.8%) and that of the Stoxx 600 as a whole (3.9%) is near the highest since 2016. Yet their earnings growth is expected to stall this year. EPS for Stoxx 600 banks in 2019 is projected to be little changed, according to data compiled by Bloomberg, after rising almost 5% last year. The euro-zone economy is slowing again. The ECB’s downgrade of the growth outlook this month was one of the biggest in years, while the Bundesbank gave up on a first-quarter rebound in Germany as the nation’s industry stumbled. It’s all set the stage for low rates into the foreseeable future. That’s the doom loop -- slowing growth and low yields, a toxic combination for banks. Until that changes, there’s little prospect for their earnings, valuations or share prices to improve. GLOBAL TRADE CONTRACTING AS GLOBALIZATION REVERSES A “HARD” BREXIT AHEAD AS PARLIAMENT SIMPLY WON’T APPROVE ANYTHING PRIME MINISTER NEGOTIATES!